So like… there’s a new update :D Lottery Ticket! 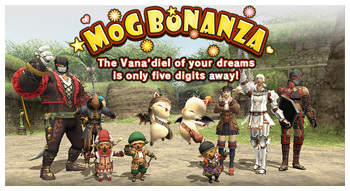 Mog Bonanza marbles available for purchase from May 16 till May 28. The winning numbers will be announced on June 30. Prizes available for collection from July 2 till July 31. The prize pays for itself, well at least the 1st prize. 1/100,000 will win, cost 1,000 gil per try, so statistically, well if uyoutaken into account 2nd 3rd prize… then maybe not, but SE do hope you people pick Rare/Ex! So it further deflates the economy. SE made these dates… notice they are split across 3 months, so you’d have to keep your mules for 3 months :D so if you have 20 mules of all lv5, that’s 60 bucks xD, make more cash than the expansion packs for 30 bucks and… there is no cost to this… extra bandwidth? lol Oh… Hard Drive space! Anyone who pick Rare/Ex gotta think again. Eg. Dalm +1 or Rare/Ex GKT from Love. You can buy a RELIC with 100m gil… 100 Dynamis Run will give you way too much currency than you need. Use the FFXIAH Relic Calc and you will see why. Interesting Poll on FFXIAH here.